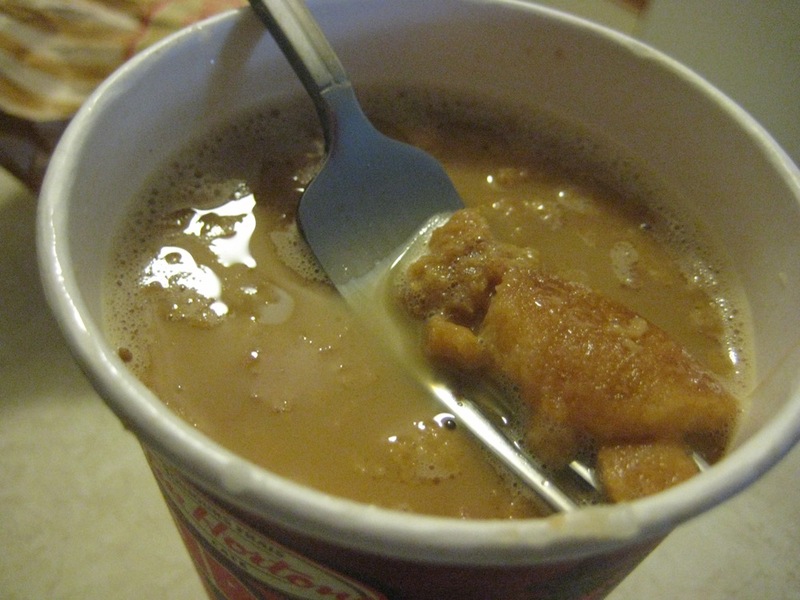 A blog about putting weird things in coffee. 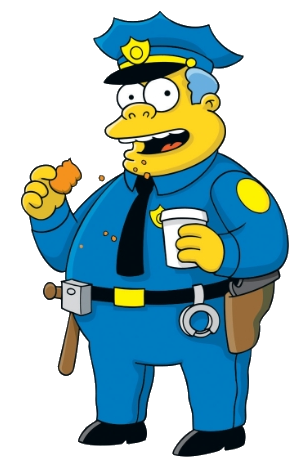 If television and movies have taught us anything, it’s that police officers subsist entirely on coffee and donuts. It is only logical, then, to put the two together, and name it after cops. 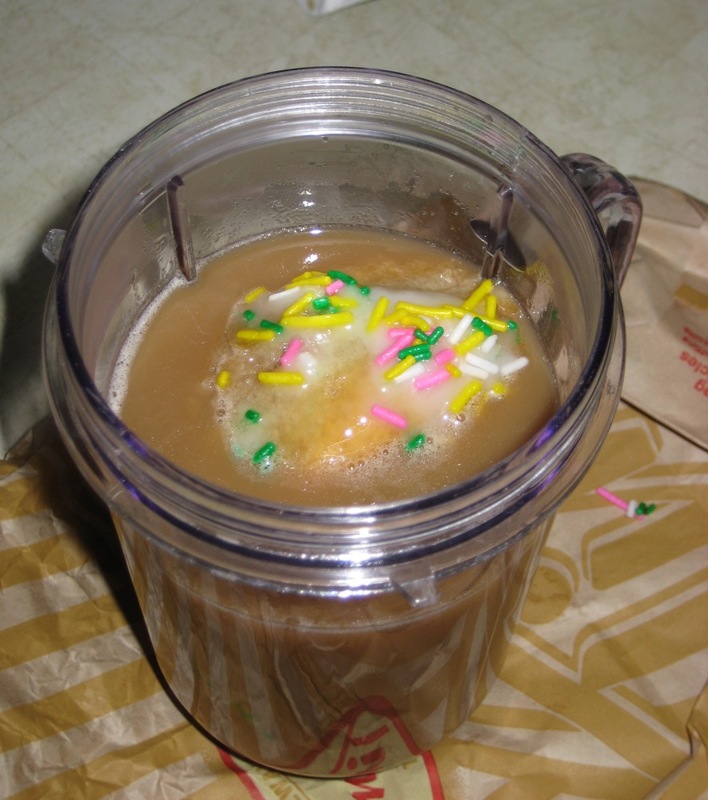 Here is copfee. 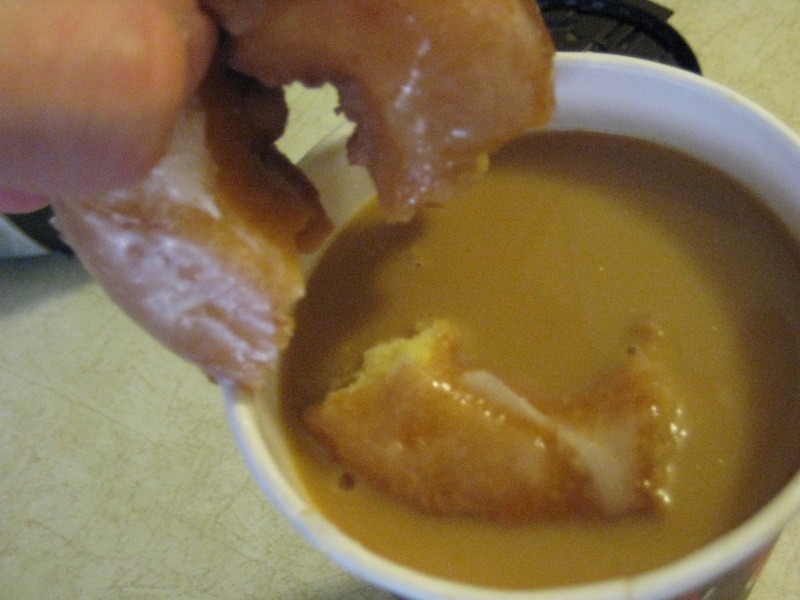 The first thing I tried was simply dipping a donut (sour cream glazed) in coffee. A curious thing happened: I held it there for a few seconds (to snap a picture), and when I tried pulling it out, it had disintegrated into mush, and a piece of the donut was breaking off, getting sucked into the coffee. 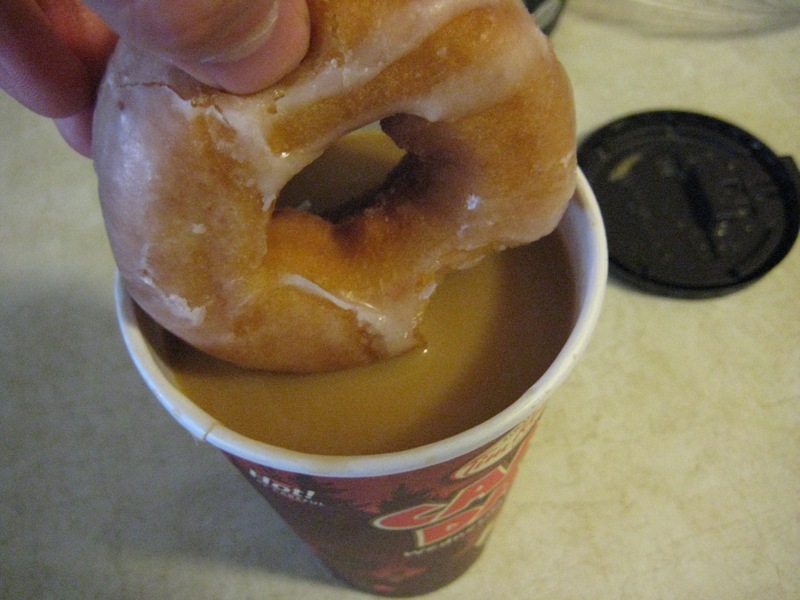 It was like the coffee and donut wanted to become one, so they could be together forever. It continued to liquify as I pulled it out. The rest of the coffee had donut mush on top. It tasted kinda good once I got over the slimy texture. But surely there must be a better way to integrate these flavours. I got myself more coffee and a vanilla dip with sprinkles, then went to work. By “went to work” I mean I put them in a blender. I took the lid off, and immediately noticed the smell; it was like I’d walked into a donut shop. That smell of freshly baked bread and brewing coffee. It tastes much the same way. 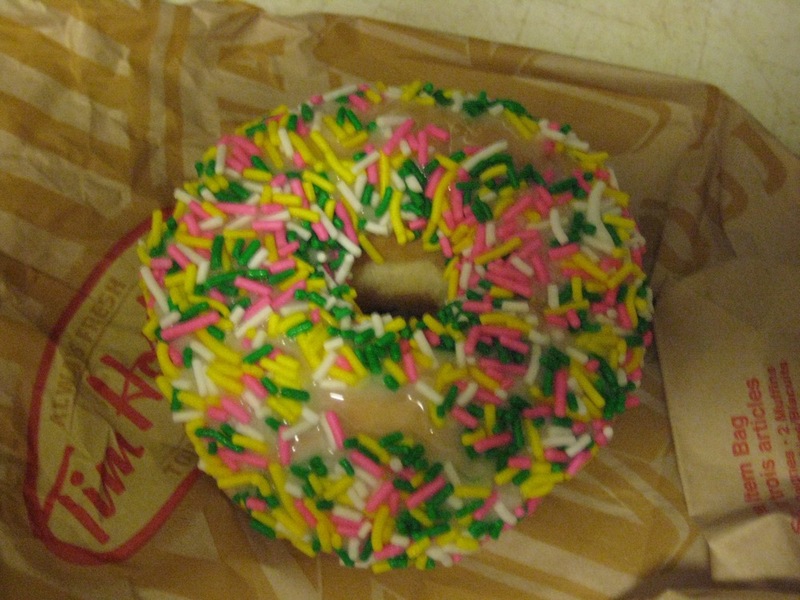 The main flavour that comes through is the breadiness of the donut, although the icing and sprinkles are hanging around too. This is actually not bad. 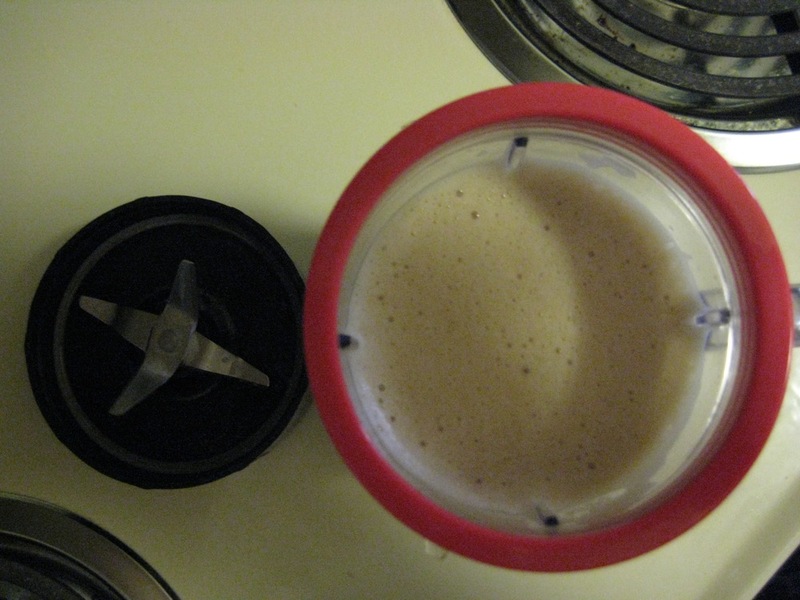 The baked dough taste is something I haven’t yet experienced in my coffee creations, and it works. I’d do this again, but maybe with a slightly higher icing to dough ratio. There is a sludge at the bottom as usual, but not much of one, presumably due to the aforementioned donut-liquifying powers of coffee. Copfee needs a bit of work before I can label it a success, but it’s close. And when I get there, expect to see me setting up a booth outside the local police station to fill cops’ cups. I’ll either be unimaginably successful or arrested for perpetuating cruel stereotypes. Damn…that looks amazing. I would totally buy a Copfee frap. I wonder if getting a creme-filled donut (say Boston creme) would solve the icing ratio issue? Great idea! 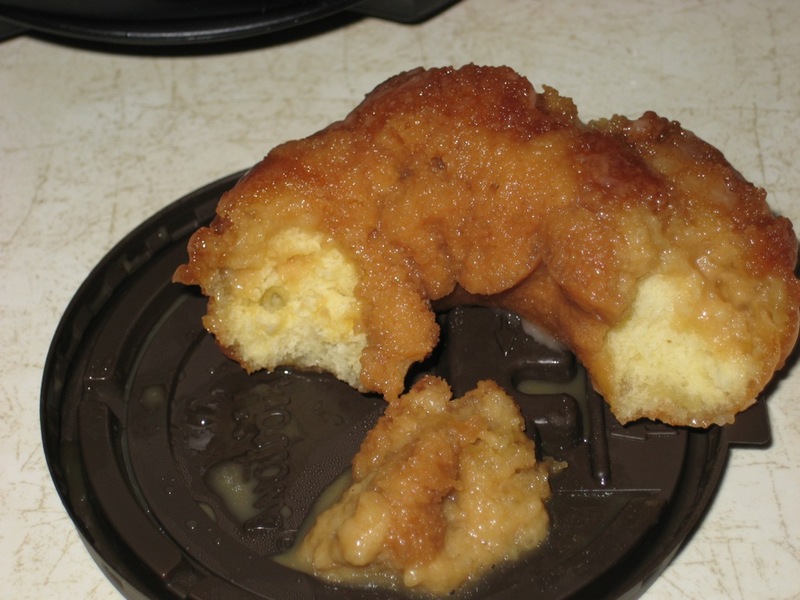 I think Boston creme would go great with coffee, as long as the gunk in the middle didn’t go all curdly. Back when Timmy’s used to sell those nice, soft chocolate-caramel-pecan cookies, I used to dip those (like biscotti) into my coffee. It was great, but because the cookies were so soft, chunks broke off, and sank to the bottom. I ended up fishing out the chocolatey-gooey goodness with a spoon, and just eating it. 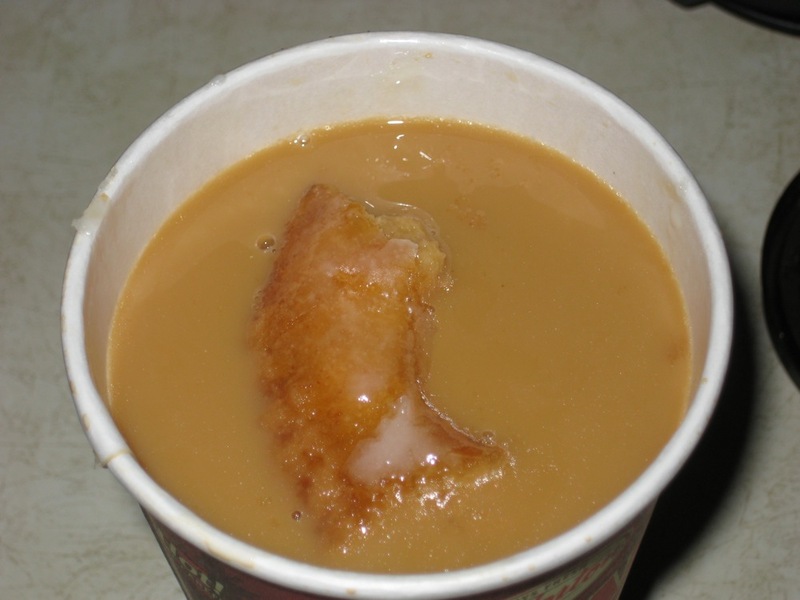 The classic way to do the Copfee is with a plain, unglazed donut. And not from a Tim Horton’s/Dunkin Donuts kind of place, but rather from the locally-owned mom & pop donut shop. They taste sooooo different—and way better. Give it a whirl. Show your friends and co-workers that you're not afraid to go beyond cream and sugar (or at least read about someone doing it). 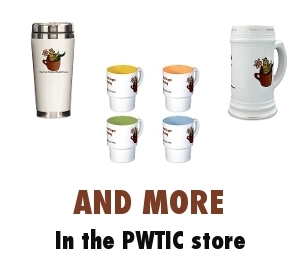 When you shop at the PWTIC Store, all proceeds go directly to buying more weird crap to throw in coffee. "Please make the bad man stop." 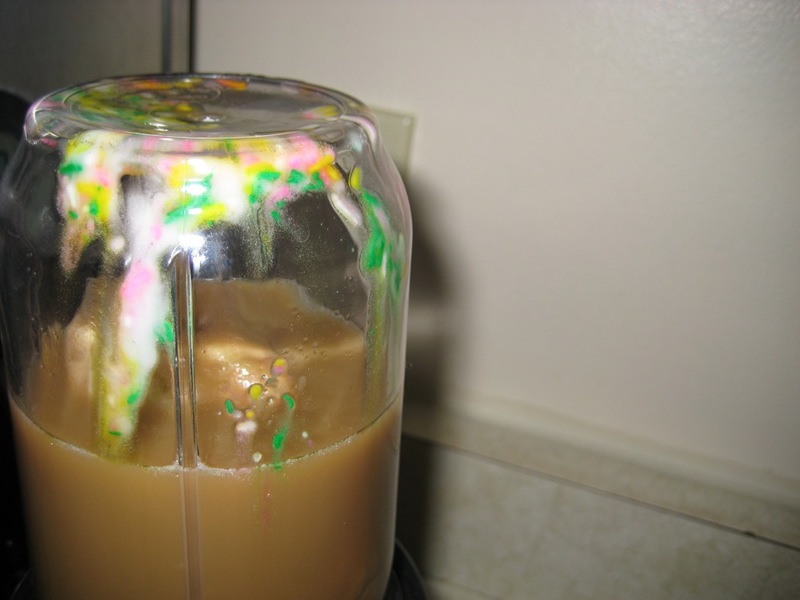 "My research turned up a site from a person weirdo who adds random things to his coffee. For example bacon, blue cheese and bananas. I can't imagine how dull his life is to get that bored..."
"A good cup of coffee requires no additional ingredients." - $15.00 - Get our own domain name. - $20.00 - Some kind of fancy black velvet backdrop for photos. - $25.00 - Trip to the Asian grocery store. - $35.00 - Blender or food processor. - $50.00 - Get our own web hosting and be a real web site. - $??? - Hire a hand model. Click below to donate. Every cent is appreciated so much. We would have a toast in your honour, but people don't really toast with coffee. Unless otherwise noted, all text and pictures were created by Phronk. It's released under a creative commons license, but I'd appreciate if you sent me a note if you use this stuff for anything. This work by Phronk is licensed under a Creative Commons Attribution-Noncommercial-Share Alike 2.5 Canada License.